Tonight: Cloudy. Showers. Low in the upper 30s. Tomorrow: Morning shower. Afternoon sunshine. Highs in the mid 50s. Monday: Morning snow. Little to no accumulations Clearing late. Highs in the mid 40s. It has been a chilly March. Thanks to the timing of the weather systems, March is going out like a lamb. 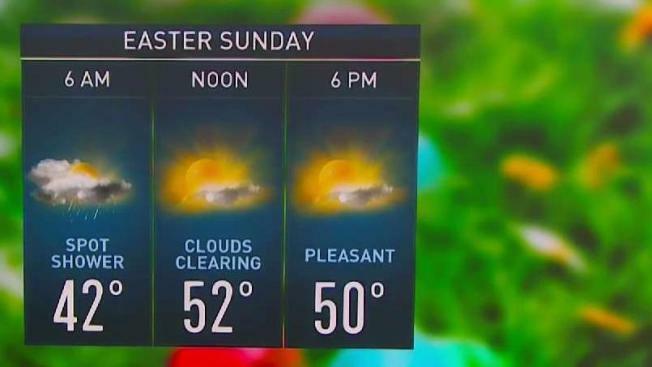 Showers are possible overnight and will clear out during the morning on Easter. By late Sunday morning, the sunshine should return. Let’s talk about the cold. The average temperature (which is an average of the high and low temperatures for the month) for March is 36.9 degrees. Once again, March will be colder than February for the second year in a row. Although it happened in 2017, it has only happened two other times in Boston’s recorded weather history: 1960 and 1984! If you want warmer, spring weather, you’re going to have to wait a while longer. Temperatures will be close to average over the next 10 days or so. There is a little snow we have to talk about, as well. Sunday night into Monday, we are expecting some snow, but there are a couple of things working in our favor. First, it’s early April and the sun angle is getting higher up in the sky, which works against accumulating snow. Second, most of the snow will fall AFTER sunrise, and again, the April sun is higher in the sky. Third, it has been in the 50s the last couple of days, so most surfaces are pretty warm. Minor accumulations (under 2 inches) will be possible on grassy surfaces. The week will remain unsettled. On and off showers will be possible for the remainder of the week. There is some good news for the Red Sox Home Opener! We should be caught in between storm systems, which would mean sunny skies, but it will be relatively cool.